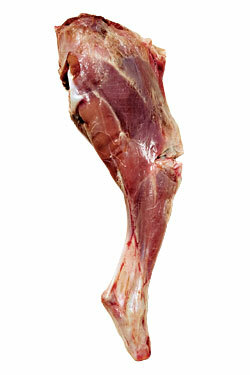 Is goat the most popular meat you’ve never eaten? Could be. A dietary staple in most of the world, goat is prized for being as high in protein as beef, lower in fat than chicken, and relatively easy to raise. (They make good pets, too, apparently.) With a flavor that’s earthy but not off-puttingly gamy, and a good local supply raised by a network of farms from Pennsylvania to Vermont, it should be an easy sell. But in New York, where haute chefs are increasingly embracing the offcuts and nasty bits of other animals, goat meat is still relegated to “ethnic restaurant” status. You’ll have no problem finding Caribbean goat soup in Brooklyn or mountains of tacos de chivo in Queens, not to mention curried goats, stewed goats, and jerk goats sprinkled throughout the boroughs’ ethnic enclaves. At many of these places, English is the second language. Think of it as the great high-low, ethnic-assimilated divide: There are restaurants that serve goat, and restaurants that serve goat cheese, and never the twain shall meet. Until now. Thanks to the efforts of a few goat-loving crusaders, and a more intrepid fine-dining public, goat might finally be going mainstream. Exhibit A: Cabrito, a hip downtown restaurant actually named for a young goat, specifically the baby kid that is pit-barbecued in Texas, where the goat-eating tradition is as ingrained as the brisket-eating one. Chef David Schuttenberg, who last cooked at Fatty Crab, hadn’t really cooked goat before, but was intrigued by the idea of it. “There’s something a little bit edgy about it,” he says. “It’s a chef’s food for sure. It has richness without being super-gamy. It definitely has some funk, and I think that that’s kind of the allure for me.” Schuttenberg buys whole kids mostly from boutique barnyard purveyor Vermont Quality Meats, marinates them for 24 hours, and “wet-roasts” them with a little water over a bed of onions, garlic, pineapple, and chiles, then serves the pulled meat with a stack of warm tortillas. Carlucci-Rodriguez buys her supply from Elly Hushour, who raises both dairy and meat goats on her thirteen-acre Patches of Star Dairy farm in Pennsylvania and sells them at Union Square Greenmarket. “Demand has gotten so high, I haven’t been able to keep up,” says Hushour, who has seen goat-meat sales triple in the past five years. If a Greenmarket presence establishes goat’s locavore cred, its trendiness potential is reflected by the meat’s incursion into the wine-bar world at Blue Ribbon Downing Street Bar, where chef Sefton Stallard transforms it into curried goat sliders served on house-baked challah rolls with red-pepper aïoli. Still, if one man can take credit for the current mini-craze, it’s Scott Conant, a chef whose career path is positively littered with the carcasses of baby goats he’s cooked at Chianti, City Eatery, L’Impero—even at Carlucci-Rodriguez’s wedding, which he catered. At his current restaurant, Scarpetta, he goes through twelve kids a week. Not everyone has been so prolific. John Fraser put blanquette of goat, a riff on blanquette de veau, on his first Dovetail menu. “The clientele wasn’t ready for it,” he says. But maybe it’s all in the packaging. Conant’s old haunt L’Impero has been reborn as Convivio, and Conant’s braised capretto is gone, but chef-partner Michael White has countered with a spectacular Molise-style baked pasta incorporating a savory goat ragù. Besides being delicious, it’s a great gateway goat dish. Some might not be able to tell exactly what kind of meat they’re eating, but it sure doesn’t taste like chicken.